In a questionnaire survey, parents and grandparents were asked what they did to prevent their offspring from falling over when they were learning to walk in and outdoors. Below are the top 9 answers. "Just watch them all the time." "The playpen keeps them in one place." "They are easier to look after when they are in their walking chair." "Put padding like pillows and stuff around the furniture." "Let them fall! They won't do it again." "Keep them restrained from falling with a harness." "Only let them play on grass." "Falling is part of growing up." "Don't let them out of the buggy." Some of the above can be brief solutions but sooner or later your child will need to be allowed to develop newfound mobility and Thudguard may be an excellent alternative to those choices. Most parents, grandparents and carers make sure that a safe environment is available where there is a high priority on vigilance. But accidents often happen even in the most careful of situations. Some of the options from our questionnaire above clearly show a need and desire to prevent the possibility of head injury, apart from option 3, the walking chair, this just made life easier, and option 5 & 8 which suggests that pain is knowledge (see FAQ's - "is pain a learning curve?"). There is much controversy over the walking chair being dangerous and causing more harm than good and even death. Research thoroughly before deciding to get one. For more information on products and safety and how to "child proof" your house, visit the RoSPA and the Child Accident Prevention Trust websites. Actually we coped "just fine" before dual circuit anti-lock brakes, air conditioning, cholesterol medications, seat belts and air bags, telephones, antibiotics, Thudguard hats and a whole host of other features of modern life that were once dismissed as excessive and now we view as essentials. Don't look back - look forward! 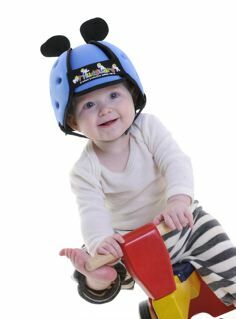 Thudguard is just one more option that we didn't have before, taking the safety straight to the child's head by reducing the risk of head injury even more.